Stu and Sindi are discussing their relationship and where it is going and Stu wants to know where she stands. Sindi tells him with tears in her eyes that she's not going anywhere because he was there for her in the bank and the fire and she loves him and won't walk away from him. Harold is telling Paul about the bones (they belonged to a white male who died late 1800's) and how the police aren't interested now. Paul asks to see the police report and when Harold leaves to get it, Paul starts to walk out a route in the garden as if he knows where something is. Just as he has found the ‘X' spot Harold comes back and interrupts him, asking him into No.24 to read the report. Paul seems a bit reluctant to go with him. Lyn is on the phone to Michael inviting him over for a meal and a chat, which he agrees to. Valda is surprised at Lyn making an effort with Michael. A knock of the door interrupts the conversation. Sindi comes in crying. She doesn't want to burden them, but they insist. Sindi tells Lyn she can't cope with being Stu's full time carer for the rest of his life and she regrets lying to him earlier. A tired Connor is back from working at the fire site and wants a peaceful night in, but Carmella reminds him they're going out with one of her friends and that her mum will babysit. She tells him that Lou and Harold were over looking for more bones in the backyard. Lyn and Valda are saying comforting words to Sindi, but she didn't think she'd be in that sort of relationship until she was 89. They again offer comforting words but Sindi says she is a coward. They say she isn't and that she must learn to ask for help. Sindi tells Lyn she is wonderful and a great mum but the look on Lyn's face suggests she doesn't think that, well not at the moment anyway. Connor is trying to persuade Carmella he can work all day and party all night and be the perfect father and boyfriend, even though he is shattered. Toadie comes home and Connor asks him how Steph's case is going, to which Toadie says it can go either way but doesn't want to talk about it he's having a bad day and year. Connor and Carmella invite him out to the Community Hall for drinks and to meet Carmella's friend. Toadie suddenly cheers up. Valda is teaching Oscar animal impressions and sorting out Charlie's possessions when Michael comes round. He spots Valda carrying a box of Charlie's possessions and comments that 'Charlie's favourite jumper' which he'd never seen before, must be a 'new favourite'. Valda doesn't look impressed at his comments. Harold is seeking out Paul's views on the new coffee shop being a mixed business - an agency for dry cleaning, photo processing, a post office. Paul is impressed. Lyn is trying to butter up Michael and that both families could get to know each other and help each other through it but Michael says it would be dishonouring his father. Paul is asking Harold about David's political aspirations. 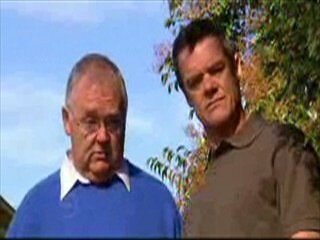 Harold tells Paul that David is lacking self-confidence but Paul says he should still go for it. They talking about having someone as 'friend in the chamber' but they are obviously thinking differently. Harold tells Paul Lou and himself are off to do more digging in a wider area and Paul wonders why. Stu is exercising when Sindi comes home, and says he wants to keep active instead of sitting around. Sindi says she can come up with some alternative exercising! She mentions he has another mention in the paper and reads it out to him. The report describes her as a 'female companion' and she suggests to him if that's all he thinks of her. As she is reading the report starts to talk about Stu's injuries so she stops reading but he starts joking as to who could play him in a film - he wants Al Pacino. Harold comes rushing in to tell Paul about the bone Bob found at No 30 and that they will have to do more digging tomorrow. Harold is very enthusiastic but it looks like Paul is just humouring him. Sindi is feeding Stu strawberries on the new sofa. They begin to talk about how if one sense goes the rest become finely tuned. He asks her if Susan has chosen green paint for No. 28, she asks why. Stu says he smells green paint and Sindi says it is kind of greenish and perhaps his other senses are compensating. She starts to kiss him seductively. Connor, Carmella, Toadie and Carmella's friend Theresa are chatting idly about clothes when Toadie inadvertently insults Theresa. The men leave to get more drinks and at the bar Harold tells them about the bond found in No. 30's back yard. They start joking about it and Harold leaves feeling miffed. Toadie tells Paul that they should tell him the truth and Paul tells no he should tell Harold. They all look bemused and Connor tells Toadie he should watch himself with his comments when they get back to the table and learn to relax. They're having their meal and Michael says he regrets not making up with Charlie before he died. Lyn asks how he knew about Charlie & Valda's marriage - Charlie phoned to let him know and it was a complete shock. Valda says Charlie never forgot him, but Michael doesn't seem to believe it. Lyn tells him that Charlie & Valda were really happy together and that is what mattered. Michael is jealous that he was dropped in favour of Lyn as soon as Charlie found out about her. Lyn tells him to get over it and move on but Michael isn't happy at that comment either and threatens to leave. Theresa is saying Carmella has changed since she's started going out with Connor. Toadie starts going on about his work and how much he lost in the fire. Sensing that the conversation has died again, Connor takes him away from the table on a pretence and tells him to relax and get his rhythm back. Carmella gets a phonecall saying Maddy is unwell and for them to go home. They leave, and leave Toadie and Theresa together. Sindi has come out of the bedroom dressed seductively, telling Stu to blindfold her so she can experience what he's going through. They both go for a walk and promptly fall over! They joke about it and end up kissing. Carmella tells Connor he's a changed man when Maddy is around. Toadie comes home and they discuss how it went with Theresa after they left. He tells them she deserves a medal for being kind to dumb animals. Michael is saying he inherited his stubborn streak from Charlie. Lyn agrees and says so did Steph, especially fighting her cancer. Michael is reluctant to believe her good qualities after what she did. Lyn tries to plead Steph's case and Michael accuses her of changing her tune now Valda is here. Lyn denies this and says she was in shock earlier and now believes her to be innocent. Michael takes offence at this and the real reason he was invited round for dinner. Before he leaves he tells her he'll see her and 'her murdering daughter' in court.